The liberal media, from websites like Mother Jones, to cable news outlets like CNN, are understandably concerned at how effective “memes” are becoming for conservatives in communicating an idea or behavior, using an image or GIF, that goes viral spreading from person to person online, often with the aim of conveying a specific theme, or meaning represented by the meme. Following that unexpected meme-driven success, well-funded conservative groups are making a more organized push to train young internet-savvy right-wingers in the art of meme-making, enlisting a growing army in what they see as the coming meme war of 2020. Turning Point USA, the conservative campus group that organized the conference, is merely one of these organizations seeking to sway hearts, minds, and elections via meme trainings. And it’s clear that when it comes to political memes, the left—which has never taken them very seriously—is trailing the right badly, and falling even further behind. As almost any website owner can tell you, when promoting an article or website on social media, when a post is shared with a captivating image, or a meme, it will garner far more “shares” than a post without an image, which is what makes memes so effective. To be able to make a point with an image, communicating a simple idea via a caption or an overlayed image, will make that idea stick in the mind far more than reading a lengthy post, especially if it is humorous. 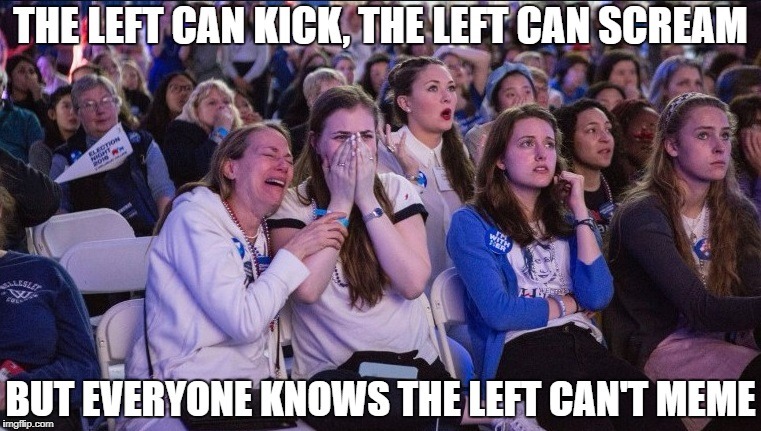 That right there is why “The left can’t meme.” Everything offends them, they have lost the ability to find humor in most things because they are too busy looking for something that may offend someone, somewhere, because they are so focused on being politically correctand attempting to force everyone else to be politically correct, they have stunted their own sense of humor. Let me provide a recent example: Burger King put out a promotional ad for their new “Vietnamese” burger, where people are seen holding the burger in massively over-sized chopsticks to feed it to another person. The eight second clip shown below. Some found it amusing, some thought it was silly, but liberals….. no, they screamed “racist.” In fact one woman was so offended that Huffington Post interviewed her. 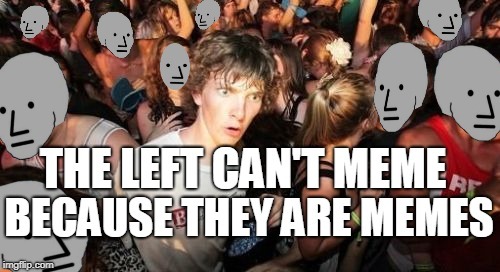 Humor is subjective, something I find amusing may not be another person’s cup of tea, so to speak, but to take offense at every little thing, and to make a huge deal out of it, is one of the main reasons why “The left can’t meme,” and the reason they are so freaked out over the fact that memes have become such effective tools to promote conservative ideology, or just to make a point. CNN’s Brian Stelter on his Sunday ‘[UN]Reliable Sources’ show, discussed the “meme wars,” asking his guest David Axelrod, if “Democrats understand what they’re up against,” after showing a Joe Biden meme created by viral meme maker Carpe Donktum, to which President Trump retweeted on Twitter.